As part of a disciplined approach to trading it is vitally important to keep a diary and track your trading activities. It is especially true for novice or new traders, but equally for a trader of experience. There is no wrong or right way to keep such records. Using a method that best suits your personality or way of working would be recommended rather than just using someone else’s approach (although researching what others do is a good idea). That way you can ensure you will be motivated and aligned to use and update regularly. This type of record keeping provides a great basis for enhancing discipline and enables you to analyse your outcomes and thus understand the possible shortfalls in your approach and adjust them. Successful traders have a disciplined method of tracking their activities; they use this information to know exactly what works and what doesn’t. Unsuccessful traders know they should track and analyse their trades, but they don’t. 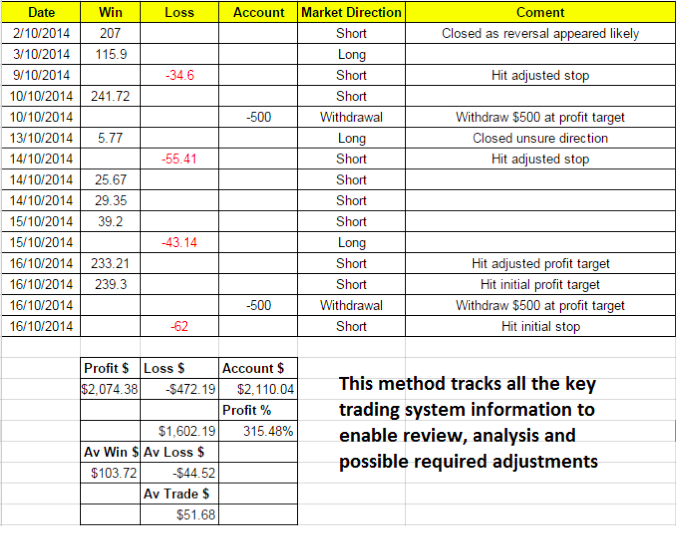 Below I show a snapshot example of one of my own trade record keeping for a particular trading style. It tracks each individual trade taken and summarises the overall systems profit and loss performance. You can see from this example it is a statistical method of tracking performance. Another approach you can use would be to diary more description of each trade and its outcome. What Product Was Traded and Why? In here you would describe the reasons for taking the trade and what it was. What Was The Loss and Profit Target and Why? In here describe where you plan to exit and the reasons for it. What Was The Trade Outcome? In here describe how the trade ended up, how you managed the trade and things that affected your decision making. Using a more descriptive approach helps you analyse not only the trades themselves, but also how you acted before, during and after the trade. This is very useful information and will reveal to you the type of trader you are when reacting to situations, essentially you are looking into your trading psychology. As always with the subject of trading there is a lot of web based resource you can research. Try Googling something like ‘keeping a trading diary’ and you will find plenty of material to read up on. Finally we encourage interaction and your input, perhaps you would like a certain topic covered or you might have a view on one of the topics discussed. Whatever it may be please feel free to add your comments.